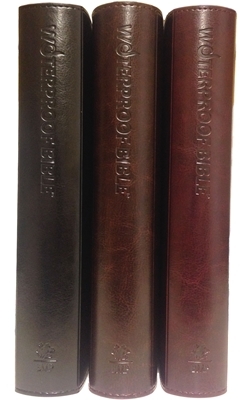 It is time to dress up your Waterproof Bible with an Imitation Leather Waterproof Bible Cover. Using one of the highest quality imitation leathers available, we manufacture these slip covers to fit your Waterproof Bible like a glove. Pockets on the inside of the cover slip over the existing front and back cover of your Waterproof Bible making it easy to put these on and take them off. These are currently sized to fit our complete Bibles. Black and brown slip-covers also have 3 ribbon markers built in. Burgundy is no longer available.